Are you looking for a great Oktoberfest celebration to attend this fall? Look no further than Hermann, MO. 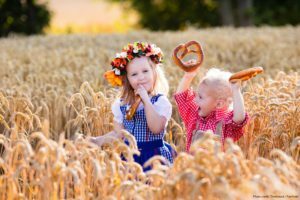 Each October, the town hosts Hermann Oktoberfest, a month-long celebration of the town’s German heritage, the autumn season, and good food, wine, beer, music, and more! Hermann Oktoberfest is a tradition in the Missouri wine country that invites thousands of visitors to the area. Visitors enjoy the beautiful fall foliage and scenic landscape, as well as the local history, vineyards, and authentic German food. This year, make plans to attend Hermann Oktoberfest on any of the weekends from September 30th to October 30th this fall. German immigrants settled in Hermann, MO in the 1830s and 40s with the hope of creating a German colony on the American frontier. Their efforts were successful and from these immigrants came a unique heritage that has made a lasting impression on Hermann. During Hermann Oktoberfest, this heritage is celebrated and visitors are encouraged to learn more about it at two historic sites during their visit. In October, the Historic Hermann Museum at the German School offers self-guided tours of museum rooms. Similarly, the Deutschheim State Historic Site features a free exhibit on German Immigration to Missouri during the celebration. Unlike many Oktoberfest celebrations which typically last a few days or a week, the Hermann Oktoberfest is a month-long celebration. Any weekend in October is a good weekend to come to Hermann and visit all the wineries in the region that take part in the celebrations. While some events change with the weekend, there is always live music, good food, and great beer and wine. But before you make your plans, check the Hermann Oktoberfest event calendar to find out which weekend’s activities are best for you! If shopping for handmade, local gifts appeals to you, plan to attend the 65th Annual Arts and Crafts Festival. This year, the festival will occur on October 8th and 9th at Hermann Middle School. This Hermann Oktoberfest tradition always offers a wide variety of handcrafted items made by local artists and craftsmen for sale. From noon to 11:00 p.m. every Saturday during Hermann Oktoberfest, Jaycee Bier Garten is the place to be. Live music starts at 1:00 p.m. and runs for the rest of the day. In addition to live music, Jaycee Bier Garden also offers guests beer, wine, and great food. If you decide to attend, be sure to look for, and compete in, the stein hoisting contests that happen several times a day. Win or lose, the commemorative steins they have for sale make a great souvenir from Hermann Oktoberfest. One of the main reasons people visit Hermann, MO is to visit the many wineries and vineyards in the area. There is no better time of year to do just that than during Hermann Oktoberfest. The local wineries, as well as breweries, take part in the Oktoberfest celebrations and offer live music, German food, beer, and wine all October. In addition, some wineries, like Lost Creek Vineyard, really get into the festive spirit with punkin’ chunkin’ events and wagon rides around the vineyard! For visitors who want to fully celebrate the season, plan to visit Pin Oak Farms in New Haven, MO in addition to Hermann Oktoberfest. The farm is just a 20-minute drive from Hermann and offers all the best autumn activities. Make the short drive and enjoy every fall favorite including a u-pick pumpkin patch, hayrides to the pumpkin field, a five-acre corn maze, a petting zoo, and more! Plan Your Visit to Hermann Oktoberfest With Us! To ensure that your trip to Hermann Oktoberfest is as memorable as possible, make plans to stay at Hermann’s best upscale lodging. Hermann Hill is a bed and breakfast in Hermann, MO that has offered guests an award-winning experience for more than 20 years. During your stay with us, you will experience luxurious accommodations and amenities tailored to your every need. Discover what makes Hermann Hill the best bed and breakfast in the area and book your stay today!